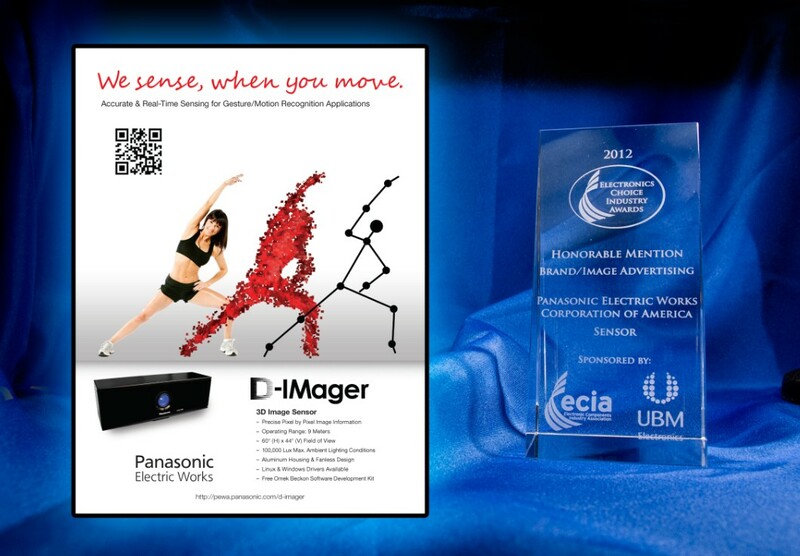 I was thrilled earlier this month to accept two Marketing Excellence awards from the Electronics Component Industry Association (ECIA) on behalf of the Panasonic Electric Works (PEWA) Marketing team. 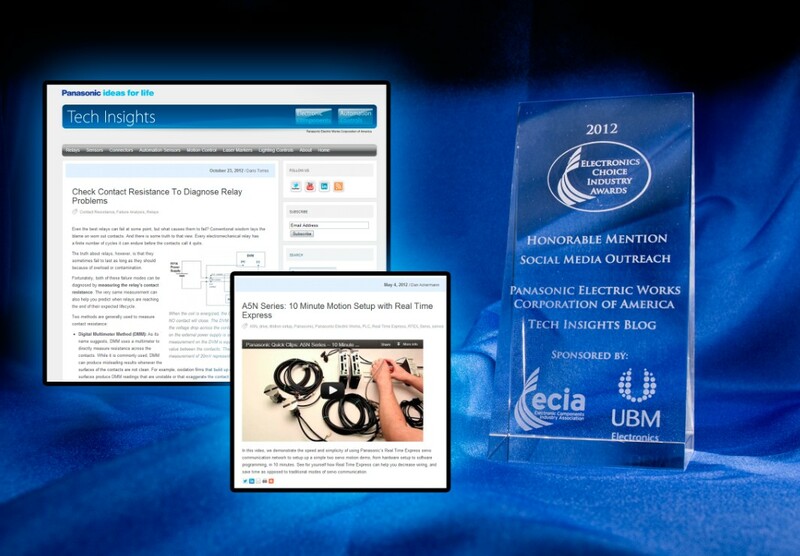 The first was in the Social Media Outreach category (Honorable Mention), recognizing PEWA’s TechInsights blog. We set up the blog 12 months ago, to establish Panasonic’s engineering team as the “technology experts” for electronic components and industrial automation. Thanks to the contributions of 13 members of our technical team (go to the blog for a roll call! ), we now have a solid library of technical articles, and a regular readership of electrical and electronic engineers. I particularly want to mention Mike Jones who developed and manages the blog. The PEWA team also received an Honorable Mention for Brand/Image Advertising. To demonstrate Panasonic’s new D-Imager sensor, Nick DeGaetano and Mike Jones created a visual that shows the technology pathway from the actual image, to a pixelated rendering, and then a digital “skeleton”. The inclusion of a QR code in the ad drove customers to a video demonstrating the product in action. Throughout the twelve award categories, it was clear that the quality of Marketing by the leaders in the electronic components industry -notably element14, Mouser, TTI and Avnet – continues to excel, and the use of digital techniques in particular is taking root across the industry. I’d like to congratulate and thank the entire PEWA Marketing and Technical teams for their hard work and support of our marketing programs. Next Next post: Car Rental in 5 Minutes? Avis Still Tries Harder….